The Lister limestone fireplace with recessed lights on each side is made of solid Portuguese limestone. With a mantle spanning 1320mm (52”) and standing tall at a full height of 1100mm (43”), the Lister fireplace would make a wonderful addition to any home, particularly in the living area. The Lister fireplace will provide warmth and comfort to your whole family for many years to come. Appealing to younger and older generations, its inside dimensions of 865mm x 813mm (34”x 32”) is the perfect size for building a safe indoor fire. Crafted from quality materials and limestone, the Lister is both efficient and safe. A number of tests are conducted to ensure its safe installation and maintenance within your home. When professionally installed, it will add a touch of elegance and sophistication to your living area, especially with the added touch of recessed lighting. Customers may choose from a matching limestone back panel and hearth, or, alternatively, a black granite back panel and hearth (for an additional cost). Just had our fireplace fitted by The Fireplace Warehouse,more than happy with it and the service provided throughout. Really pleased with our new fireplace and fire,took us a hile to choose as there is so much choice there, but decided on the limestone lister fireplace with legend vantage gas fire. Exactly what we wanted,plain and modern design,lovely limestone finsh all at a good price. Beautiful Limestone fireplace that looks even better in our living room than it did in the showroom. 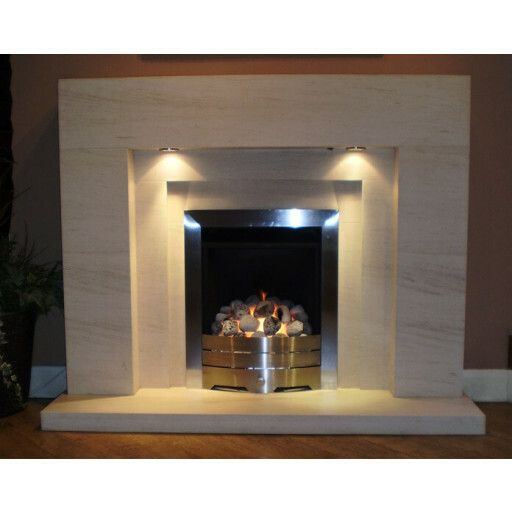 Great value limestone fireplace,downlights included in the price. Just had our new fireplace fitted,looks even better than when we saw it in the showroom,superb fitting service as well. JUST HAD OUR NEW FIREPLACE FITTED AND IT LOOKS AMAZING,GREAT SERVICE FROM START TO FINISH.